Microsoft just released its Q4 2012 earnings report, posting just $192M in operating income before taxes and its first ever loss ($492M) due to the writedown the company took because of its failed aQuantive acquisition. Revenue for this quarter was $18.06, up from $17.41 billion in the last quarter and $17.37 billion in Q4 2011. Loss per share – and this is the first time Microsoft reported a negative EPS in its history – was $0.06. Analysts previously expected Microsoft to post around $18.13 billion in revenue and earnings per share were expected to be around $0.62 on earnings of around $5.3 billion. These numbers don’t reflect the aQuantive writedown, however. 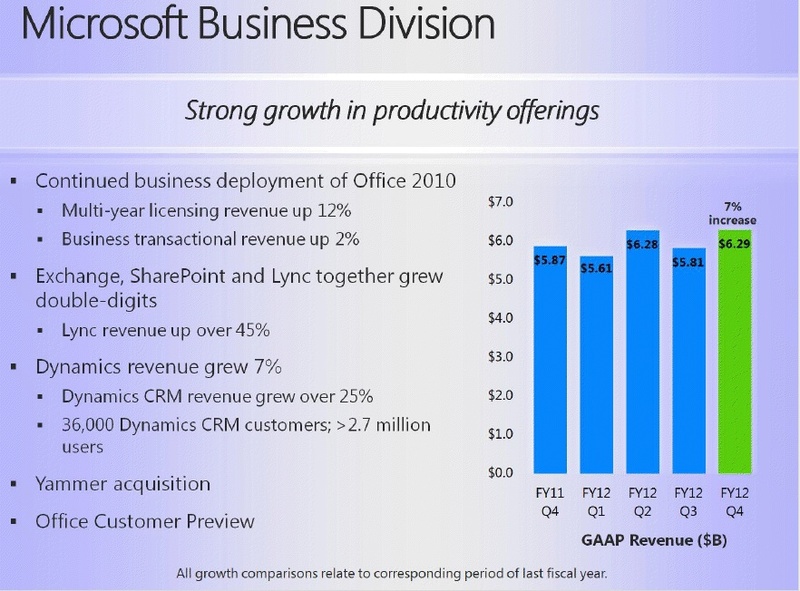 In the year-ago quarter, Microsoft reported a profit of $5.9 billion and $4.5 billion in Q4 2010. 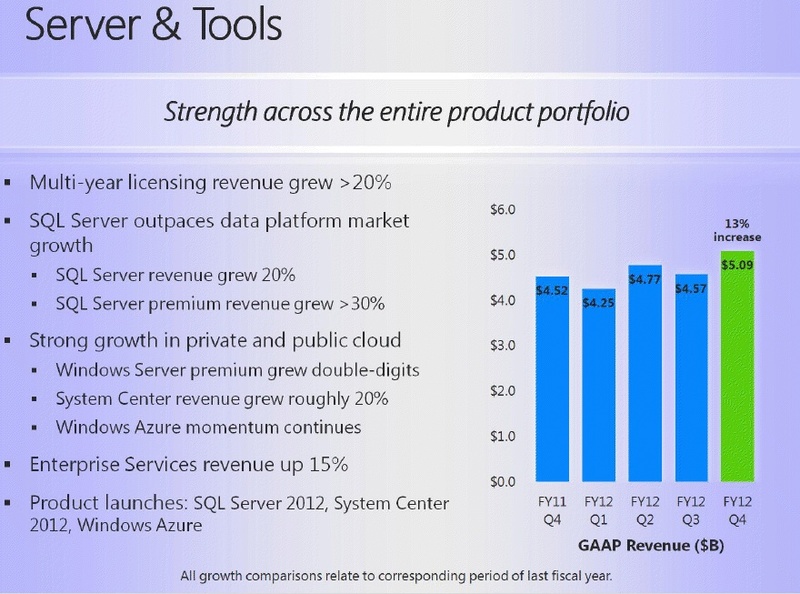 For the full fiscal year, Microsoft reported revenue, operating income, and earnings per share of $73.72 billion, $21.76 billion, and $2.00 per share. Adjusting for the goodwill impairment charge (that is, the aQuantive writedown) and deferred revenue, Microsoft says non-GAAP fiscal year 2012 revenue, operating income, and earnings per share were $74.26 billion, $28.50 billion, and $2.78 per share, increases of 6%, 5%, and 5%, respectively, over adjusted non-GAAP fiscal year 2011 figures. Ahead of today’s announcement, some analysts already expected Microsoft to post its first loss in its 26-year history due to its flopped 2007 acquisition of digital advertising firm aQuantive. Because of this, the Q4 numbers include a $6.2 billion writedown to reflect the lower value of Microsoft’s Online Services Division. The Online Services Division, which is also the home of Bing, has increased its revenue of the last few years but still posted a loss of $479 million last quarter. 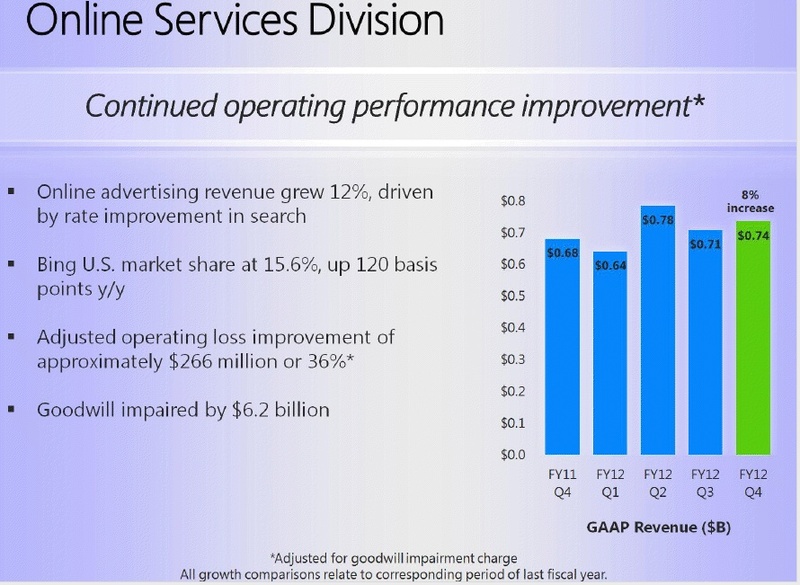 This quarter, revenue for the Online Services Division grew another 8% and loss was down to $266 million. Last month, Microsoft also announced that it would defer between $450 million to $550 million it expects to make from its $14.99 Windows 8 upgrade offer. 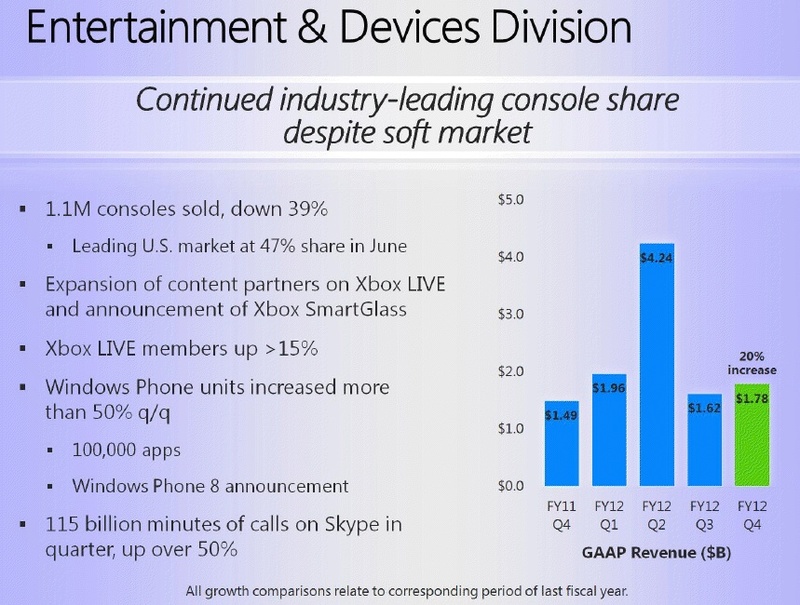 Besides taking the writedown on the aQuantive acquisition, though, Microsoft, of course, had a very interesting last quarter. The company acquired Yammer for $1.2 billion and made a $300 million investment in Barnes & Noble. The company also acquired $1 billion worth of patents from TechCrunch parent company AOL and then sold 650 of these 925 patents to Facebook for $550 million in cash (and licensed the rest to Facebook as well). In addition, Microsoft also announced its Surface tablet computer which will go on sale after the release of Windows 8 in October. With Windows 8 coming out soon, chances are that some PC buyers are postponing their purchases until the fall, which is partly responsible for the slowdown in PC sales. 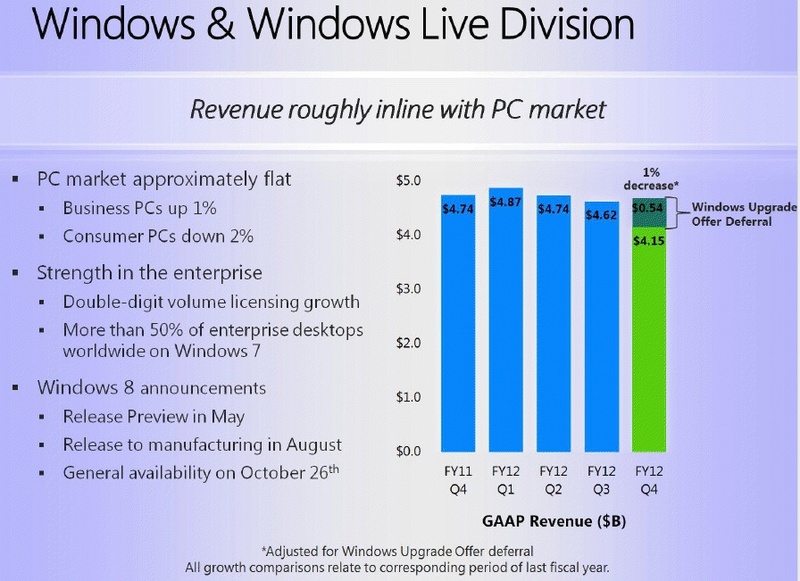 Microsoft’s Windows Division, which also includes Windows Live, posted some gains last quarter.